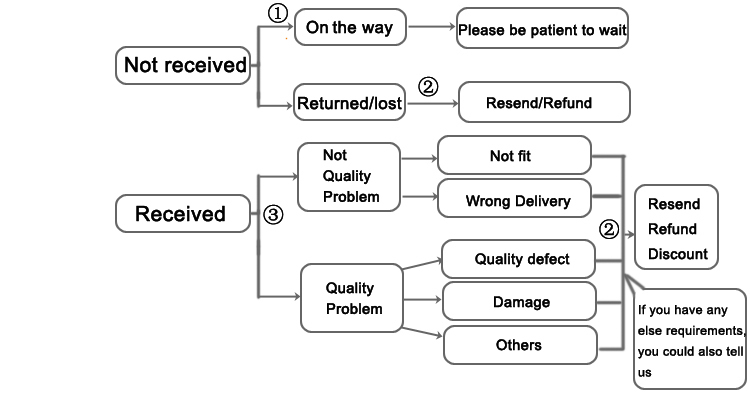 The shipping way we have: China Post, HongKong Post, Singapore Post, ePacket, EMS, DHL, TNT, UPS, FedEx, Special Line (Aramex, ZTO), etc. If APO/FPO or PO. Box address, we can only ship via China Post, HongKong Post, Singapore Post, ePacket and EMS, cannot use DHL, TNT, UPS, FedEx. 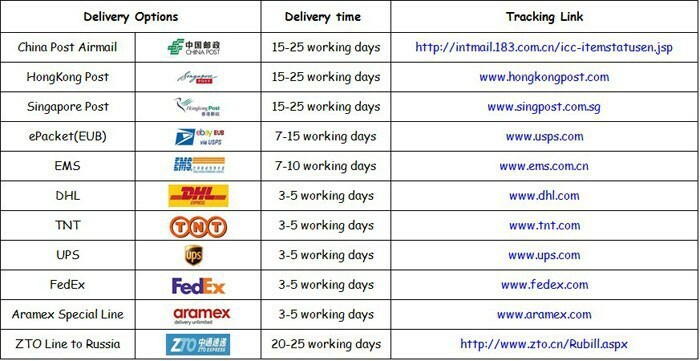 Most Free shipping items (value below 80-100usd, weight below 2.0Kgs) are shipped from China using China Post Airmail, reach most of the countries within 15 to 25 business days. Usually, if the items value is above than 80-100usd, we will ship it out by express, such as EMS, DHL, TNT, UPS, FedEx, Special Line (Aramex, ZTO), etc. If you want to ship the item by DHL, UPS, TNT or Fedex, you have to provide us your CPF No. (tax No. ), that’s is necessary for shipment and customs clearance. But if you use EMS, Singapore post or Hongkong post, it doesn’t need CPF No..
EMS Service only to specific countries: Russia, Belarus, Ukraine, etc. 3 months Warranty. Buy with confidence. If item is defective in 3 months, we will send you a replacement without extra charge, or offer refund after we receive the defective item. Please check the tracking information on tracking website. Please contact us by meesage,e-mail,or trade manager. Check the package and item carefully. You can resell all our items on your own shop. After you get the order from your client, you can place the order on our store, we can ship the item directly to your client address. Leave us your client shipping address and telephone number when place your order and tell us your accurate demands. Our success depends on your satisfaction, therefore Your feedback is extremely important to us. If you are satisfied with our productss please leave us positive feedback. Please contant us before leaving neutral(3stars) or negative(1-2stars) feedback.We will try our best to solve the problems and please trust us!